The "Mosco Glacier" route is located in the same geographical setting as the Southern Ice Field, in the middle of one of many Patagonian valleys crossed in recent history by settlers and occasional adventurers who left the tracks which we try to find today. The trail is an interesting combination of geographical settings in which we advance towards the Andes mountain range, passing by lakes, glaciers, mountain ridges, old growth forests and reforestation that covers an extensive area of gigantic charred tree trunks resulting from a past forest fire. 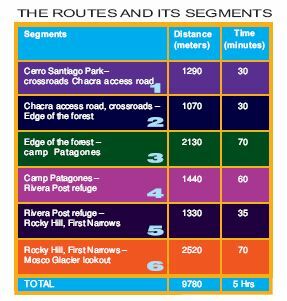 The circuit begins in Villa O´Higgins, at an altitude of 265 meters above sea level, specifically in Cerro Santiago Park, administered by the Municipality of Villa O´Higgins in conjunction with the National Forest Corporation (CONAF) and ends at the Mosco Glacier at 678 meters above sea level. It is a linear route, or in other words, departure and return go over the same trail. It is 10 kilometers long and is marked from beginning to end. It can be hiked in approximately 5 hours throughout the entire year. During all seasons the scenery invites contemplation: spring signals the emergence of green and the flowering of the Calafate, the Chilco and the Notro; summer offers fruit; while in autumn the majestic forests overwhelm with their beauty, turning brilliant red of many different shades. It is important to point out that the marked trail follows an old trail used by the first inhabitants of the zone in 1930. Since 1997, the renovation work has been carried out by the Municipality of Villa O Higgins. 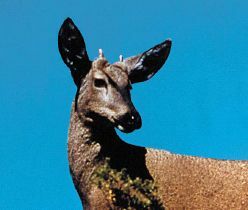 numerous species, among them the timid deer of the Andes, the Huemul. Other animals which are present are more difficult to see, such as foxes and occasionally puma. Multiple water courses offer beautiful falls, including one at the end of the path with a spectacular waterfall of 25 meters spilling a great volume of water. There are mountain and glacier lakes which show the dramatic recession of ice as a result of recent climatic change. During the course of the trail there are camping areas available and abundant water to drink. From Cochrane or Coyhaique Villa O`Higgins can only be reached by the Carretera Austral (Chile). Puerto Yungay is at Km.466, where a ferry must be taken to cross the Mitchell Fjord, and reach Rio Bravo, from this point there are approximately 100 kms. to go. -From Argentina, via Route 40, a road is presently under construction to Villa O`Higgins from RNN 40 Argentina (through Baker Pass), and its opening is programmed for 2003. 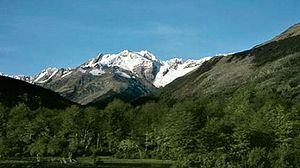 There are alternative routes through different frontier passes which connect to the Carretera Austral; Coyhaique Alto, Los Antiguos or Paso Roballos (Baker Pass). There are no direct flights to Villa O`Higgins. Connecting national flights can be taken regularly from Balmaceda (Coyhaique) and local flights or charters to Villa O`Higgins (from Cochrane or Balmaceda). The design of the signs marking the territory is based on a French system of routes for hikers, a pioneer system of its type, which is recognized worldwide for its efficiency and simplicity. The Ministry of Natural Resources has complemented these signs with a numerical system associated with points of special interest that we call SNUPIE/Guidepost (Numerical System of Special Points of Interest). These SNUPIES are represented by numbers, that on some occasions accompany the ordinary trail markers that indicate route and direction. Each one has a meaning as described in the Topo-Guide and they support a geographical interpretation of the route. From the civic plaza of Villa OHiggins walk 100 meters east in the direction of Santiago hill, until reaching Cerro Santiago Park, pass by the CONAF ranger station and reach the Guidepost 1 trail-marker, in an environment of old Ñires trees (Nothofagus Antarctica) and an extensive wild meadow crossed from south to north by the Santiago stream. At the location there are picnic tables, a playground, as well as places to rest. The trail begins with a wooden walkway, take a course of 120° and begin to climb the slope of the hill following a zigzag route between forests of Coigüe and Lengas. Other bushes cover the open spaces, among them a colorful plum tree with tubular flowers of a fire red color. The trail has several walkways and carefully built stairs which after 200 meters reach Cerro Santiago lookout, Guidepost 2. This structure is the true starting point of the trail and offers a beautiful panoramic view of Villa OHiggins, lakes, and mountains to the west. From the lookout, follow the sign that indicates a course of 130°, in this section you will find some signs identifying the main species of the zone: Coigüe, Lenga, Canelo, Calafate, Chaura, Parilla, Chilco. The oldest trees more are centuries old and exceed a height of 40 meters. Of the bushes common to the area, the Calafate is the best known and is attributed almost symbolic properties. It is actually a thorny bush of the genera Beriberi present in various species (Beriberi buxipholia is the true Calafate). Its flowers are yellow and the berries, rich in seeds, are of dark blue color: is said that anyone who eats them will become enchanted with Patagonia and will not be able to avoid returning. After a slight climb after 350 meters you will cross the Santiago stream, Guidepost 3, which feeds the network of drinking water for the town, please take especial care not to contaminate this area. A few meters later, go up a slope on a course of 90°, until a bog is reached that forces an 180° change of direction, next enter an dense forest of reforested Coigües that after a slight slope passes through some clearings from which one can make out the summits of Cerro Solo, Cerro Chela, to the southwest, and in the background, the peninsula of taitao. At Km. 1,3 the trail forks with the trail to Guidepost 4: at a 180° course with the main path. It leaves the forest until reaching terrace of wooden fence wall ground, locally as the Chacra of the Carabineros, with gigantic charred trunks that are evidence of a past forest fire. A settler of the Villa, Albano Ribera, tells the story that: it was the same year as the conflict of Desert Lake (referring to the death of Police Lieutenant Hernán Merino, in 1965) my father Pedro Ribera left in the morning to round up some animals and found that a great tree had fallen on the trail, he set fire to some branches to burn it. Unfortunately in the afternoon a tremendous wind blew up and the fire spread and burned everything you see. The fire lasted several days, but a large downpour put out it out. At higher altitude it did not burn because of snow cover. The trail continues along the foot of the slope diverging from a route that goes up the hill and reaches the Valley Lookout. Advancing further, a wooden is bridge is crossed, then follow the signs until the following fork Guidepost 5. After crossing the trail from the Chacras access road, the line of the trail ascends the slope over a very well marked trail, with a relatively fine, firm soil. The environment continues to be dominated by fallen and burned tree trunks, and the view becomes grand with vistas of the Mosco and Mayer river valleys, lakes and mountains. The trail traces a curve that follows a strong climb, to the east the Mosco Glacier can be seen. After 500 meters you find the lookout of the valley Guidepost 6, which is ideal for a rest and for viewing the horizon and pinpointing the principal natural landmarks. To the SW one gets panoramic views of the entire trail, dominated by the confluences of the Mosco and Mayer rivers and the outpouring of the river into lake O Higgins/San Martin at the feet of Cerro Solo (1,730 m.) and Cerro Chela (1,607 m.), in addition to a segment on the Argentinean side. To the west lies Lake Ciervo (Deer Lake), the Mayer river with its hanging bridge, and the Carretera Austral which leaves Villa O Higgins for Bahamondez Bay, the main port on lake O Higgins and lastly you will see some mountains of the Great Snowy Range whose slopes border the highway. In the distance over the mountains of the Great Snowy Range (Gran Cordon Nevado), are the glaciated summits of Cerro Steffen, altitude 3,067 meters, which is the principal mountain of the northern border of the Southern Ice Field, which can be accessed from the west arm of Lake O Higgins. To the south, Cerro Submarino (Submarine Hill) dominates the whole Mosco river valley and Patagonia in the distance. Its slope shows evidence of past forest fires and some streams. The view to the north is covered by the Cerro Santiago. The trail continues to the east, with the view of the Mosco Glaciers and the summit of Cerro White Huemul, 2 232 m above 2,232 m. sea level. Upon leaving the lookout one must take precaution with the trail, follow the white/orange markers that indicate the correct route and avoid a well trodden track that goes up the slope to the left. In this section of the trail, next to charred tree trunks some renewed forest and rock outcroppings begin to appear, but these are not obstacles for the route. There are several water courses crossed by walkways until reaching a large degraded hillslope Guidepost 7 which is an example of erosion in this zone. The trail follows a narrow passage in the rock, then the route continues with some slight gradients. When it rains the trail can become rather muddy, which could prohibit further advance. The vegetation is dominated by various renewed forest of Lenga and Coigue that grow among charred tree trunks. There are numerous bushes such as the Notro (Embothrium coccineum), which has brilliant and fleshy leaves with tubular flowers of fire red color, that generally grows in isolation because it needs a great deal of light. Calafate, Mutila (Empetrum rubrum) and Chaura (Pernettya pumila, P. mucronata) can also be found. After this trail, the route enters a forest that has been marked Guidepost 8. This point has a junction with an alternative path upper layout which began in the first section Guidepost 4, before leaving the wooden fence wall terrace (Chacra of the Carabineros). Entrance into the forest coincides with slight gradients up the slope of the mountain. The first 500 meters are practically flat and when the trail encounters boggy areas, tree trunks and planks are provided to help the crossing. The forest is mainly made up of Coigüe and Lenga trees that are mostly reforestation and are of middle age. The vestiges of the great fire of the Mosco begin to disappear. The crystalline waters which the trail crosses are good for human consumption. After 15 minutes Guidepost 9 is reached, a walkway that passes over a deep ravine that should be crossed carefully, especially if the tree trunks are wet. The trail continues through a dense forest of reforested Coigüe and Canelo. Upon reaching a another deep ravine the track descends to the left as marked until a gorge called the Stone Pass (Paso de las Piedras) Guidepost 10, that crosses the stream. On warm days and during spring thaw the stream can become swollen, but that does not impede further advance on the trail. After this gorge the forest is dominated by large trees with a lot of space between them, which permits the development of you reforestation and bushes. The trees are covered with mosses and lichen. The Sphagnum type mosses practically form carpets in the most exuberant sectors. Canelo Pass, (Paso de los Canelos) Guidepost 11 can be recognized by the dominance of these species at the bottom of the ravine. Advancing, you find a beautiful panoramic view of the Mosco Glacier, that on clear days contrasts strongly with the green of the forest and blue skies. A rest in this place is recommended, before descending to The Ravine of the Rapids (Quebrada de las Cascaditas) Guidepost 12. 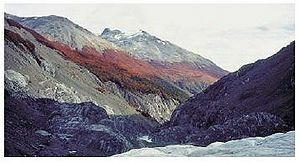 From this point large Coigües dominate the terrain and in this habitat the Patagonian Black Carpenter is frequently found. With black plumage and some white feathers, the male of this species has a beautiful head of bright red, and marks its territory with strong pecking on a hollow tree trunk. In the summer season they are silent and cautious, hidden in order to protect their young. To attract them strike a tree with a stone at an appropriate rhythm. The trail passes through a sector of reforested Lenga trees, Guidepost 13 that grow under a canopy of adult Coigües, these trees are found outside of the typical altitude level of the species, they owe their existence to the formation of cold microclimates. Under the ancient Coigües various bushes such as Calafate and Chaura grow. In sunny places the Notro or Ciruelillo can be found, while the leafy Magellanic Fuchsias (Chilco) indicates that we are once again in a more humid zone. Next you will find a deep ravine, which is crossed by a tree trunk and a rustic stairs with a hand railing Guidepost 14, be careful when descending as it is a steep grade. From "Camp Patagones" continue through the forest to the east, the trail crosses some bogs and below, among the foliage, one can just see the Mosco river. The trail begins a zigzag descent to Guidepost 16 via a dirt track that in some places passes over boggy areas. Guidepost 17 marks the end of the steep grade. Advancing through a Nothofagus forest there is a species of knots that encloses branches or tree trunks, known as "pecotras" : these are a defense response of the tree, that uses them to generate a hyper production of hormones (hyperplasia) when faced with the irritation produced by the presence of a mushroom parasite Cyttaria Darwin, That infects the tree via any injuries and cuts. The reproductive parts of the mushroom, little balls called Digüeñes can only be eaten when are young, that is to say, when they are still white or yellow. Near the bottom of the valley the trail crosses a ravine with evidence of a major washout Guidepost 18 and meters further on is a hill where a rest area has been put in place. Guidepost 19 is a rocky narrows of the Mosco river, that in addition to being a good point to appreciate the environment allows descent to the riverbank. The trail continues crossing small of water courses and bogs. 15 minutes later the bank of the river is reached in an area dominated by a stone outcropping Guidepost 20, from here the Mosco Glacier can be easily observed. For the next 400 meters the trail follows the river, crossing two washouts of the bank, here you walk between the forest and the river. Huemul tracks (Chilean Deer) are frequently found in this section, its footprints remain marked in the humid sand and with a bit of luck it is possible to catch a glimpse of one of them. Other evidence of the presence of Huemuls are Lenga trees with chewed and/or damaged bark due to the cleaning and scratching of horns, or possibly manures, hair, or sleeping caves. 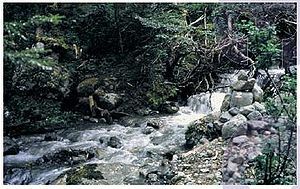 The Huemul goes down to the river to drink, but then returns to high areas of the mountain where it grazes tranquilly. Its favorite foods are: Coirón, Calafate, Chaura, Mutilla and young Lenga trees. At present the Huemul is in danger of extinction. At Guidepost 21 the trail once again enters the interior of the forest (or coming upon the edge of the river if you are on the return). The trail covers a slight grade that climbs to terrace where an extensive stems of adult Lenga trees is found, they have been broken and splintered by the passing seasons. Some meters further on Guidepost 22 is reached, the Rivera Post refuge, named thusly in honor to Don Pedro Rivera Velásquez, the first settler of Villa OHiggins, in approximately 1930. The refuge is built of Coigüe wood and Lenga tiles constructed on site of dead trees, it has capacity for 8 persons comfortably and has a steel drum adapted for a stove. 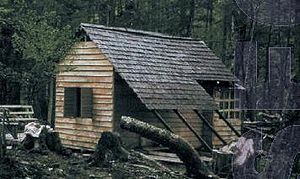 Next to the refuge you will find a reconstruction of the original shelter of Pedro Rivera, a "Patagon Shack" precariously built with split logs, that served as protection from the inclement weather of the zone, while the residents took care of their cattle. Around the refuge there are several small hikes discovering the forest. There is ample water nearby. This section is characterized by the dynamics of the water courses that converge after descending the mountains. The area is called The Desplaye. Coming out of the Rivera Post Refuge, continue through the forest via the edge of the terrace, from which the Mosco river predominates. The confluence of the Mosco with the Sangra (Bleeding) river is recognizable, Guidepost 23, that descends to the south. The purple color of its waters gives it its name and is due to the erosion of water on slopes with volcanic and intensely rusted soils. After this landmark the trail enters deeper into the forest, one must avoid the temptation of following certain paths that descend to the river. The white/orange trail markers lead to another landmark in the section, a trail passing over a mallín, ( an area over-saturated with water, and associated with abundant vegetation of mosses and Peat) via a structure of fallen trunks some 100 meters long, constructed for the purpose of avoiding trampling and deteriorating this fragile wetland Guidepost 24. Next a small stream is crossed and is you descend to The Desplaye, Guidepost 25, an interesting area where various water courses converge. At the edge of the Mosco river an extensive view towards the glacier opens up. On the border of the river a fan- shaped landslide can be recognized, made up of trunks and gravels that correspond to an avalanche of a ravine, next to this fan is the confluence of the Mosco and Turbio (Murky) rivers, Guidepost 26, that descends from Southeast. Just upstream from this confluence is a wooden fence wall of tree trunks is found fallen that coincides with a walkway of trunks that crosses the Mosco and leads to White Huemul hill. Here the forest the hiker passes through is surprisingly damaged by storms, Guidepost 27. Advance via the wooden fence wall without crossing the river until reaching another confluence with the Mosco, this time with the Claro (Clear) river, that descends from the north. Walk about a hundred meters up the bank of the Claro river before crossing. The river is crossed by a walkway marked Guidepost 28. On the western side is a rocky striation, walk at a 45° course i straight line following two stone trail markers until reaching the pass of the first rock narrows Guidepost 29. This is a good place to see the effects of ice in relief, scarred and striated rocks are observed that give a sense of the general water flow of the ice in the valley which went from east to west. To the north you can observe the ancient moraine, now colonized by vegetation. In this sector, recent studies of dendocronology (tree ring dating) have established that the oldest trees date from 1772. From the Desplaye up, the valley of the Mosco tightens and the torrentuous waters run over a steep bed. The native forest of the slopes is replaced by steep rock walls, moraine deposits and colluvium. Climb along the rocky edge marked by a Stone trail-marker, Guidepost 29, to pass the first Narrows of the upper course of the Mosco river. The height of the pass is enough to get an attractive panoramic view to the West, with the Desplaye of the Mosco, the mountain ranges of the valley, Cerro Solo and in the background Cerro Steffen of the Southern Ice Field. Changing your view towards the east, you find the upper course of the Mosco with steep walls and moraine deposits. Upon beginning the descent, one must take a great deal of caution in crossing over a complicated landslide some 35 meters long, which, despite being marked with successive white/orange trail- markers is easy to lose. The foot of this pass is marked as Guidepost 30 and from this point advances to the bottom of the valley, by the north edge of the river. The river creates a major obstacle due to a corner that reaches a rock wall and forces crossing the river in order to bypass it. Higher we find moraine deposits buried by landslides from the steep mountain walls. We arrive at the second narrows of the upper course of the river marked Guidepost 31, which is crossed by an outcropping of stones. 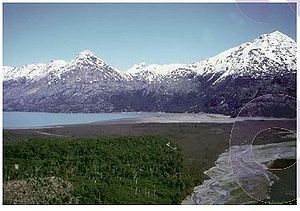 This place was the terminal point of the glacier according to a study carried out in 1945. Instability is evident in the following meters. A great landslide complicates further advance until The Remanso(The Haven), an area of transition and calm from the torrent. 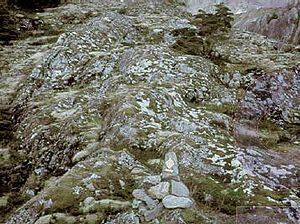 This section seems impassable, but by advancing with care between the rocks of the landslide it is possible to continue. Crawl on hands and knees if necessary. Only cross the river if the rocks available are dry and safe. Do not risk walking on wet rocks because they are slippery and can provoke a fall. After this effort, you will arrive at the Remanso, where the third narrows, Guidepost 32, must be passed by a trail marked on a rock wall on the north side of the river. Climb with slow pace and if necessary use your hands for support. Above at Guidepost 33 is a panoramic view of the trail and of the following meters, which brings you to a beautiful waterfall Guidepost 34 of 25 meters high whose origin is melting ice. The cliff of the waterfall is the last obstacle before arriving at the glacier must be reached by following the signs located on the north side. Here, the use of the hands is required one last time in a simple crawl. Again, please be careful with humid or wet rocks, because they are slippery. Once we reach above we arrive at an environment where ice is the main protagonist and gives faithful testimony of the glacier receding in recent years. In fact, in 1995 the ice reached up to Laguna Fria (Cold Lagoon) Guidepost 35 which was a great deal smaller. From the lagoon, follow for the right edge until reaching a rocky promontory called Glacier Lookout (678 m.) and marked as Guidepost 36, the end of the trail. 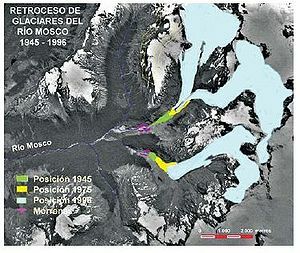 The glacier is formed by two major accumulation zones that descend in two tongues that form a great central moraine deposit; in the front there are small lagoons whose presence is explained by the continuing recession of the mass of ice, and a slope breack stream under the moraine, causing the waterfall. The mountain peaks here do not have names but we have assigned a topology to facilitate their recognition. Cerro Mirador: (Lookout Peak) altitude 1,788 m. above sea level. This name has been assigned due to its dominant position on the two main tongues of the glacier. Cerro Catalina: Altitude of 1,894 m. above sea level. Beautiful hill of white glaciated slopes. Cerro White Huemul: Altitude of 2,230 m. above sea level. Highest peak in the Mosco valley. Escarpado Chain: we have assigned this name to the chain of hills that make up the interfluvial between the Mosco and Claro rivers. It contains peaks with elevations between 1,670 and 1,606 m. above sea level. This trekking is described in full detail in the following topoguide of the Ministery of Public Patrimony. 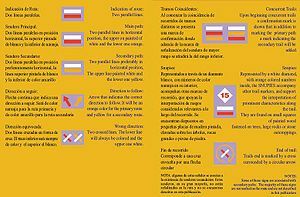 The printed guide can be obtained for free in the Ministery:56-2-3512100 -> 2325. It is hihgly recommended to take it to the walk, as it enriches the experience with descrptions of flora, fauna, geography and geology. Try to go on the trip accompanied and well informed. Only follow the route that is marked not straying into other paths. Return if weather conditions deteriorate. Do not leave any kind of litter lying around, take it back with you and deposit it in proper containers. Do not take any souvenirs from the natural environment. Camp only in authorized sites and at least 50 meters away from the water. Avoid fires, and if there is no alternative, use only dead wood. Do not cut the branches off the trees. These protect the floor from the wind and erosion. As you leave make sure that you turn the fire off with lots of water.Remember that the wind can reactivate the smallest ember in a few minutes. You may only enter the ice sector accompanied by a guide and with the appropriate equipment. Be very careful with hidden ice patches. Have as little contact as possible with wildlife and if you do see huemules, allow them to have an escape route and stay as still. Any trail that they leave: hoof prints, antlers, marks on the trees, tell us of their lives, leave them where they are, take note and photograph them. Share your information with the park keepers of Conaf or other institutions, they may be important for the conservation of these animals.